KOTUR announces the opening of its first retail concept as a shop-in-shop at the newly launched SOGO Department Store in Tsim Sha Tsui, Kowloon. Situated in one of Hong Kong's most prestigious shopping districts, SOGO's store sets a new standard for luxury. KOTUR launched the first expanded shoe collection in 2014. The range, which launched in September 2014 is a true representation of the KOTUR DNA and are stamped with a signature gold star on the outsole. KOTUR’s #getsmartbag received an Honorable Mention & Silver placement by The International Design Awards & is honored as a finalist in The New York Design Awards. The annual competitions recognize, honor and promote legendary design visionaries and uncovers emerging talents in Architecture, Interior, Product, Graphic and Fashion Design. The lead role of the TV Series Glee Lea Michele carried a KOTUR Breen Minaudiere. Kerry Washington carried KOTUR’s espey, and tops this year’s Vanity Fair Best Dressed list. Other sightings include Kelly Osborne, Kate Beckinsale and Jessica Biel. Fiona collaborates with Operation Smile ambassadors, sisters Gillian and Lydia Hearst, to design a bag to benefit the charity. 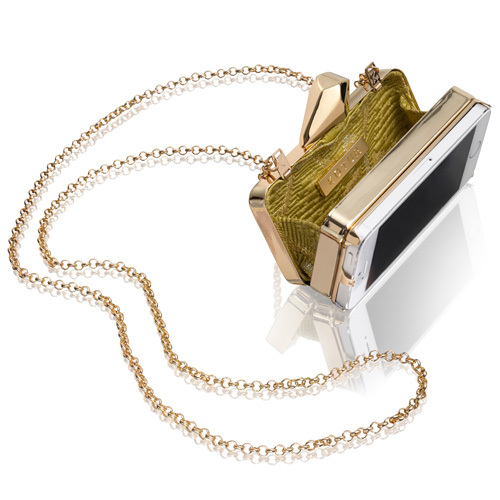 100% of the net sales of the minaudiere shall be donated to Operation Smile. The Smile bag garners plentiful celebrity endorsement and has, so far, been worn by Elle MacPherson, Anja Rubik, Kristen Ruhlin, Ellie Kemper. 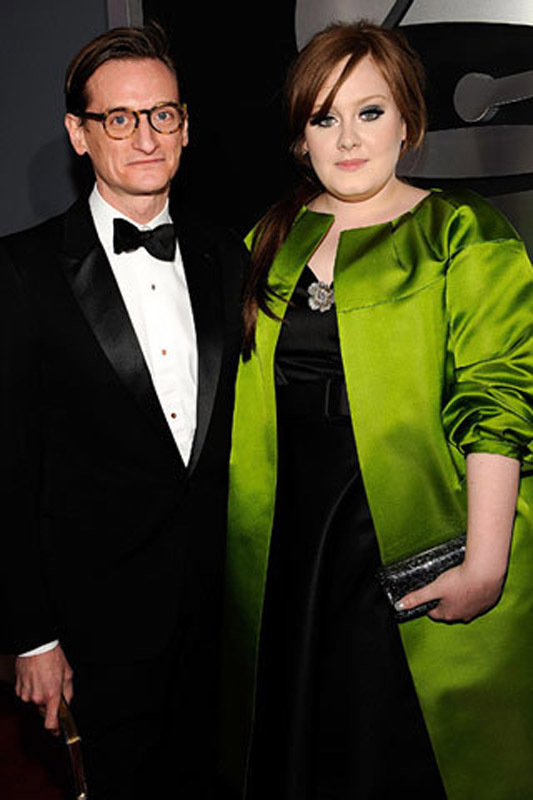 Iman and Ginnifer Goodwin carry KOTUR on the red carpet of The Met Ball 2011. Some of the biggest stars of Hollywood, Jennifer Lopez and Kate Beckinsale are spotted with KOTUR at events this year. Young Hollywood stars Lea Michele, Emma Roberts, Kendal Jenner and Selena Gomez also carry the brand. 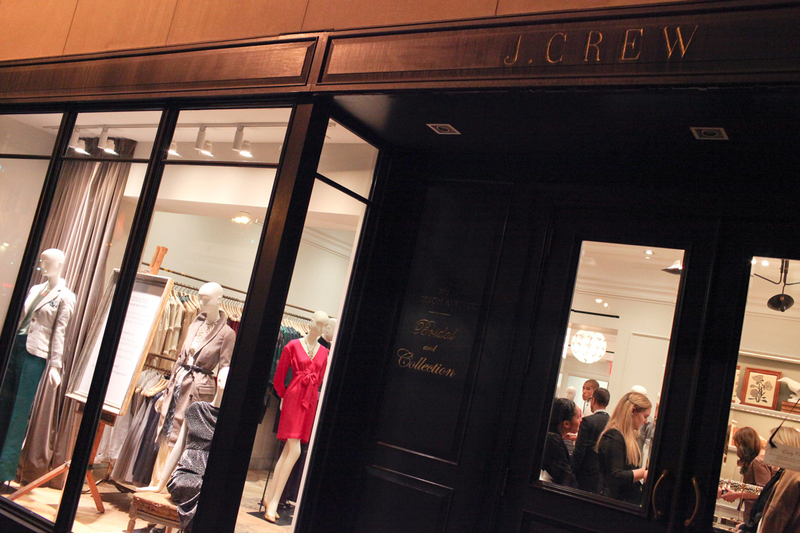 Jenna Lyons, Creative Director for J.Crew, invites KOTUR to create a range of bags for their Holiday collection. Fiona, alongside Jenna launches the capsule collection of classic minaudiere silhouettes with elements of snakeskin, grey flannel and miniature sequins at the J.Crew New York flagship store for Holiday 2011. The inaugural KOTUR for Rachel Roy collection hits the catwalk at New York Fashion week. Designed by Fiona in collaboration with Rachel Roy, the collection comprises minaudieres and clutches in KOTUR’s style, incorporating the fabrics and colors of the runway. KOTUR launches a full daybag collection, featuring totes, framebags and satchels in leather and haircalf featuring KOTUR’s signature hardwear and snakeskin trims. The collection is sold extensively across the United States by Saks and Neiman Marcus, and by Harvey Nichols in the UK and Hong Kong. On the red carpet KOTUR appears at the Golden Globes as Renee Zellweger, dressed by Carolina Herrera carries KOTUR’s d’Abo Mosiac Mirror, Jenna Fischer and Isla Fisher also carry KOTUR to the ceremony, and Diane Kruger carries KOTUR’s Creel minaudiere to the SAG awards. 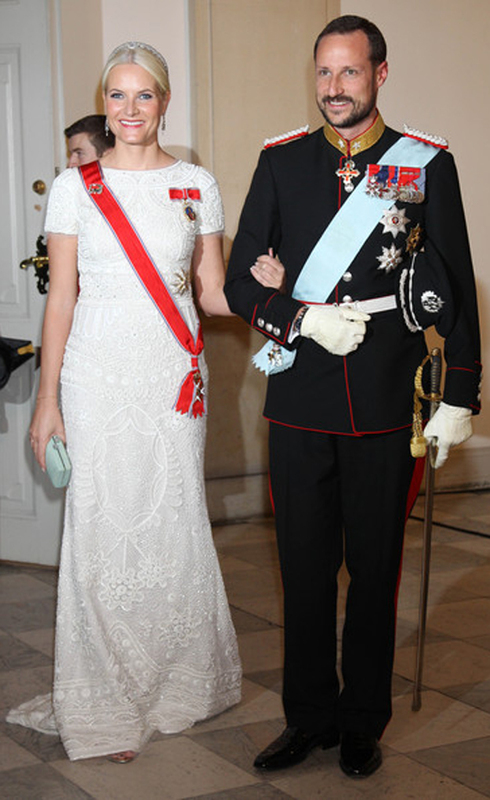 April sees Scarlett Johansson carries KOTUR’s Candela minuadiere to the premiere of Iron Man 2, and at Paris fashion week, Anna Dello Russo is snapped carrying KOTUR to the couture shows. The Costume Institute Gala, 2010 sees Bar Rafelli, Naomi Watts and Lindsay Vonn all walk the Red Carpet with KOTUR in hand. 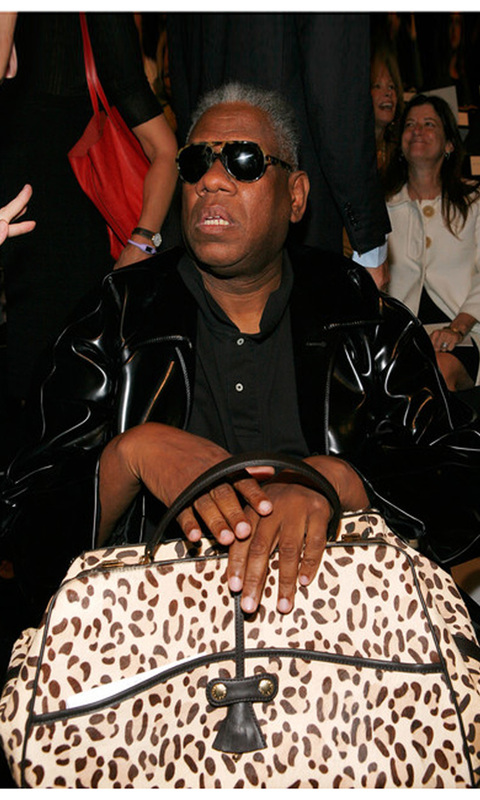 KOTUR sits front row at New York fashion week, on the arm of Andre Leon Talley who totes his custom made outsize leopard Wallace to various shows. Kim Kardashian tweets KOTUR, prompting @FionaKotur to join twitter. 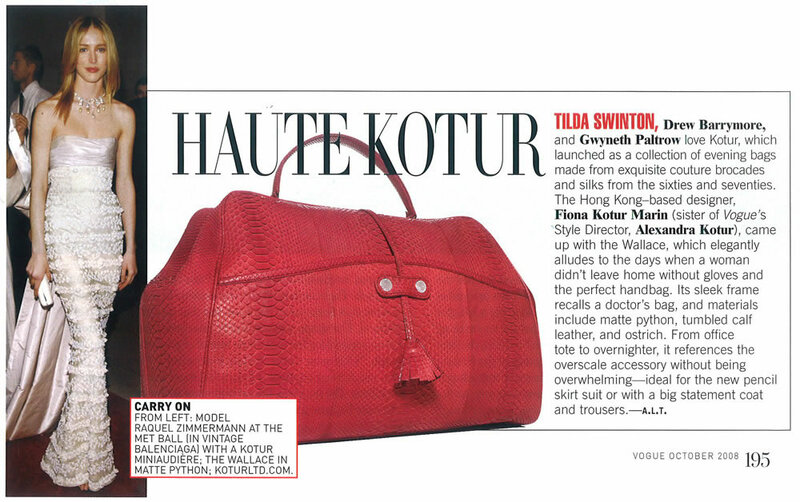 Andre Leon Tally, fashion guru and VOGUE contributing editor, commissions KOTUR’s Wallace frame tote in red python and features in Vogue’s October issue. KOTUR’s press momentum continues to grow as the brand is featured by WWD, Harper’s Bazaar, InStyle, Elle Accessories, Style.com, W and The New York Times. Vanity Fair features a personal profile of Fiona Kotur at home in Hong Kong and Oscar winning actress Renee Zellweger. KOTUR creates it’s first comprehansive collection of minaudieres, clutches and handbags. The collection is sold for the first time in Asia, in the new Harvey Nichols, Hong Kong, and is picked up by boutiques and speciality stores across Europe and America. At the invitation of Aerin Lauder, creative director of Esteé Lauder, KOTUR creates an exclusive Oscar gift bag for the 78th Academy Awards. 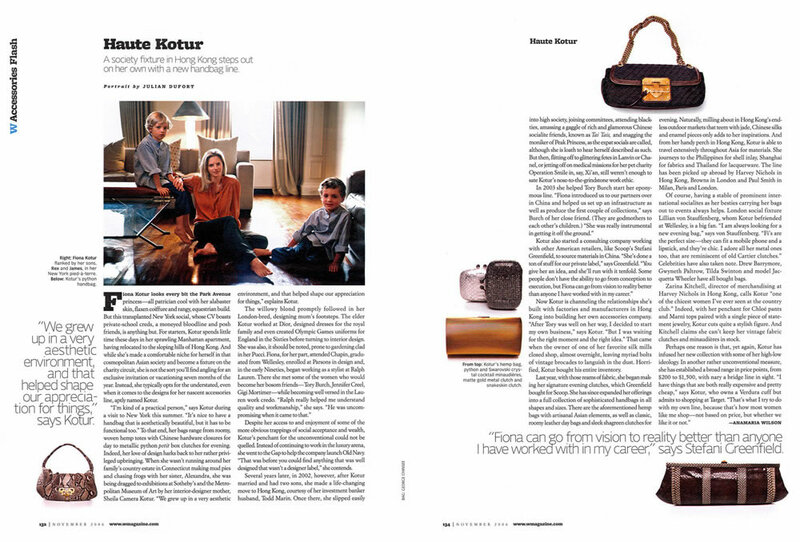 W magazine carries a double page feature on Fiona Kotur and the KOTUR brand, changing the profile of the business. 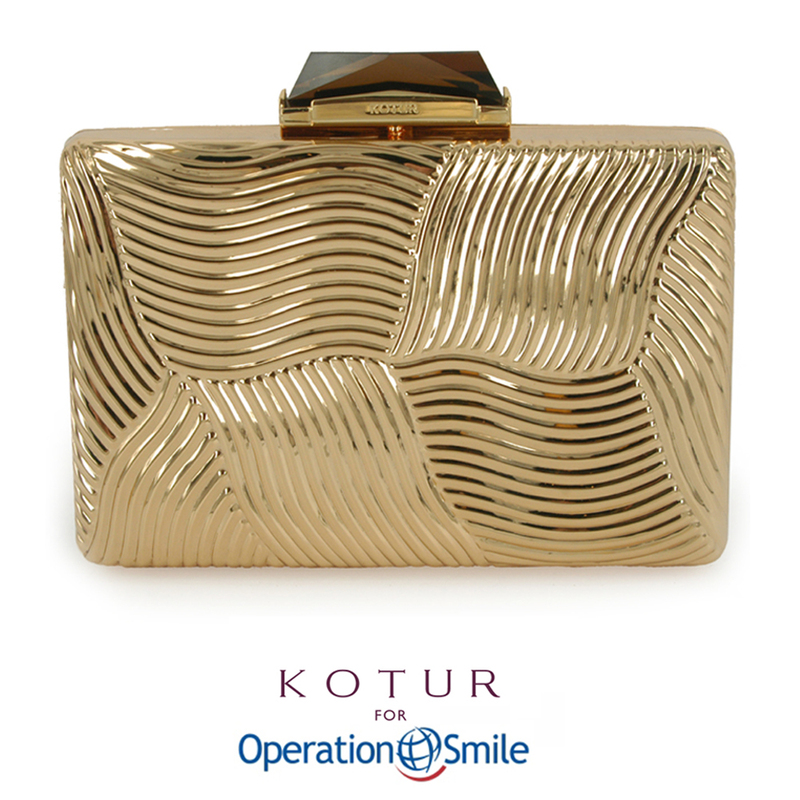 Founded by Fiona Kotur Marin, KOTUR launches with a range of limited edition, numbered Vintage Brocade clutches to benefit Operation Smile. The collection is launched by Scoop NYC and subsequently picked up by Bergdorf Goodman and London’s Browns. The newly launched KOTUR brand gains the attention of the fashion media and is featured in VOGUE, International Herald Tribune and Newsweek. Tilda Swinton, Gwyneth Paltrow, Drew Barrymore, Anne Hathaway and Princess Beatrice all support Operation Smile by carrying KOTUR’s Vintage Brocade clutches.